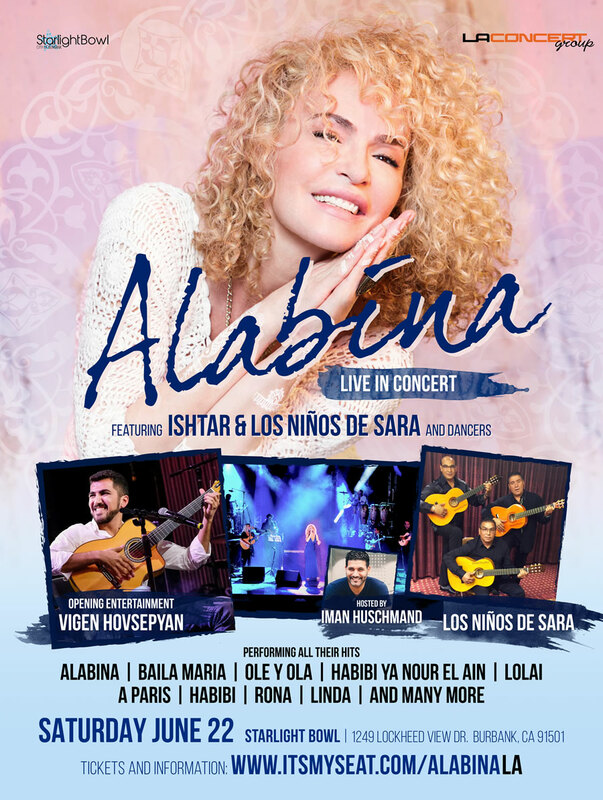 ALABINA featuring Ishtar & Los Ninos de Sara Live in Concert! Opening set by Vigen Hovsepyan & Band. Featuring Guest Rana Mansour. June 22 2019 @ Starlight Bowl! An evening of world music at it's best by Alabina - the legendary French-based group performing mix of world music: Middle Eastern, Arabic, French, Hebrew, and Spanish Gypsy music. All time favorite hits: Alabina, Baila Maria, Habibi Ya Nour El Ein, Lolai, Yalla, Apprivoise-moi, Eshebo, Linda & much more! Opening entertainment by Vigen Hovsepyan & band, and Rana Mansour! Event hosted by Iman Huschmand. Tickets are $40 to $125. The main entertainment of the evening will Alabina with the full original 13-member band Los Ninos de Sara with dancers! Opening entertainment will be by Barcelona-Yerevan based Vigen Hovsepyan and his band featuring upbeat rumba flamenco music. If you have not visited the Starlight Bowl before, you are welcome to bring along your own wine and cheese and enjoy the show! Visit the main Starlight Bowl website for complete details and to see the entire line-up of the summer concert series.